TEP. A simple refrain from The Emergent Psalter using verse 1 may be a good choice: “Come let us sing, let us shout for joy”. The tune is lightly syncopated but the ‘inside’ harmony is remarkably sedate for Mr Everett: I-IV-I in E major. However, he resolves in the last cadence to an E minor on the assumption that verses will be spoken with a backing vamp. Sung verses might well demand the Em tonality but this should be optional as it will depend on the chosen tone. 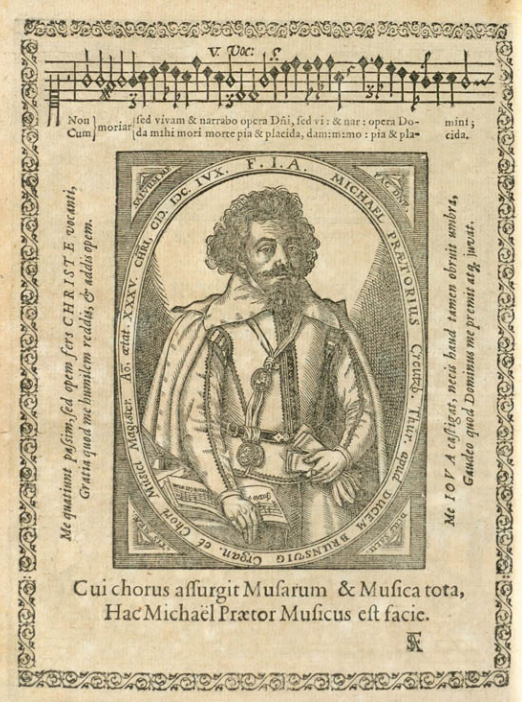 Elsewhere in the big swag, a piece by Michael Praetorius (1571-1621), impressively entitled “Venite exultemus Domino: In festo Natalis Resurrectionis Ascensionis” (being the incipit followed by a direction on seasonal usage), is remarkable for its arrangement for nine parts in three trios. Each voice was published in 1607 as a separate book (see illustration). As is his way, he directs that these parts may be for voices, instruments or organs.